Elenoa is an 11 year old girl. Elenoa's father is a farmer who attempts to raise 4 children on around $50 per week. 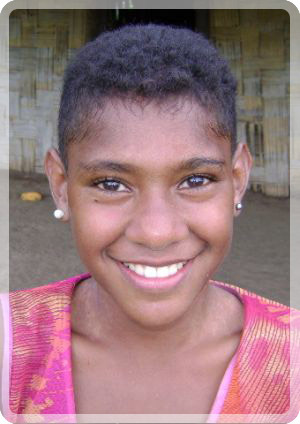 Elenoa enjoys attending school and her favourite school subject is all subjects. When she is not at school she loves to play netball, swimming, riding the horse and reading story books. Elenoa travels to school each day by foot. When she grows up, Elenoa wants to be a teacher. Elenoa is from a very poor background. She is an active girl who takes great interest in her studies and participates in extra-curricular activities at school. Elenoa now receives the education every child deserves.